Intermittent morning flurries had turned to steady snowfall by mid-day, and the weatherman was calling for additional accumulations of three to five inches. It didn’t take a genius to determine that whatever waterfowl remained in the area would be in a panic. Canada geese and mallard ducks would be looking for corn and were probably already staging an all out feeding frenzy. It was Wednesday, November 26 — the day before Thanksgiving. Winter had come early to northern Iowa and most lakes and marshes were already snow and ice covered. By now, open water had become a very scarce commodity. And although hundreds, and in some cases thousands, of birds were concentrated on the handful of airholes and river bends still open, there was no guarantee which way the hungry fowl would decide to fly. Late season birds are used to seeing and feeding with large flocks. Choosing the right spot to hunt them is always risky. Once hunters have pooled their resources and put out a big spread of decoys they’re pretty much stuck with the choice. Sunset comes early in late November, and the clock is always ticking on feeding birds. Pick the wrong field and there’s no time to pick up and relocate. I was pondering this very dilemma when the phone rang. It was good news. My friend Brandon Stark had located a windswept patch of corn stubble where birds were currently working. Better yet, Stark wanted to put together an impromptu hunt. The proposed ‘Thanksgiving Waterfowl Posse’ would also include my son Matt and fellow goose hunting enthusiast, Zach Scott. Although birds were already on the move, there was still hope for some action if everyone moved quickly. 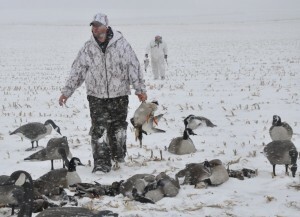 Loading the decoys and grabbing some whites, I was soon on my way. Getting directions enroute, I arrived at the field in short order. I was last on the scene, however, just in time to mess up a flock of Canadas that had begun to investigate what decoys the guys already had out. 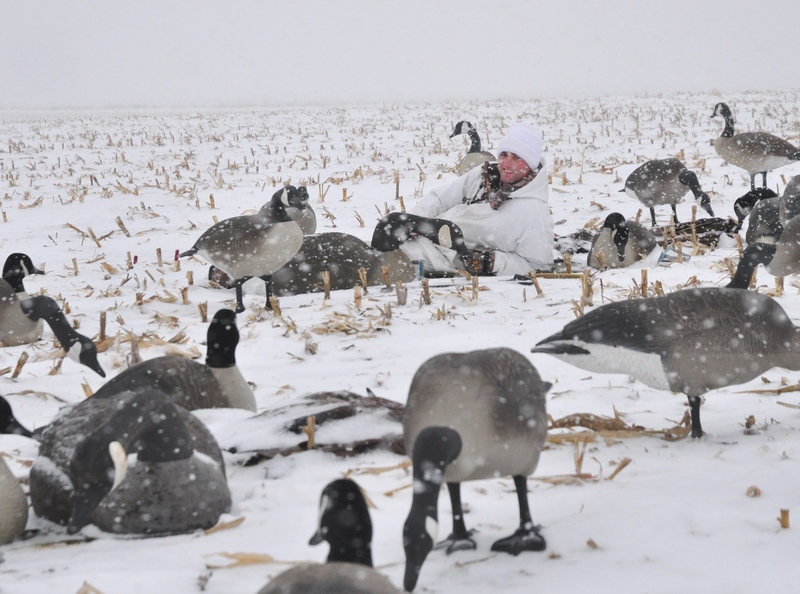 I added my contribution to the spread; within minutes we’d placed over 100 goose decoys atop the deepening snow. More birds soon appeared, and then more after that in what proved to be the beginning of a nonstop waterfowl show that would be the envy of any waterfowler — anywhere. It was as if our spread had become magnetic as line after line of geese, flock after flock of mallards, appeared out of the snow to converge on our field. We’d have likely enjoyed quick and easy limits except for two things. 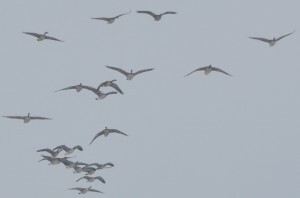 First of all, most of the flocks were huge which made it extremely difficult to get birds across the imaginary 15 yard line. The issue was further complicated by the rising wind. Blowing somewhere in the neighborhood of 20 mph, the breeze was giving large flocks of highly educated, late season honkers plenty of time to inspect our decoys. Whenever a group would break off and attempt to come in, they would invariably be warned off by wiser birds. But the afternoon was still young, and we figured the birds would become more serious and our decoys more believable as the day waned. The theory proved correct and events took a definite turn for the better when a group of a dozen or more Canadas peeled away from a big flock and came sailing in. We let them come all the way, with the birds finally touching down at the edge of the decoys. The geese offered great close up viewing as they walked about, stretching their necks horizontally while murmuring back and forth to each other. More geese continued to arrive out of the snow and we began to do a bit of shooting. Although mallards arrived by the hundreds, the wind was really working against us. 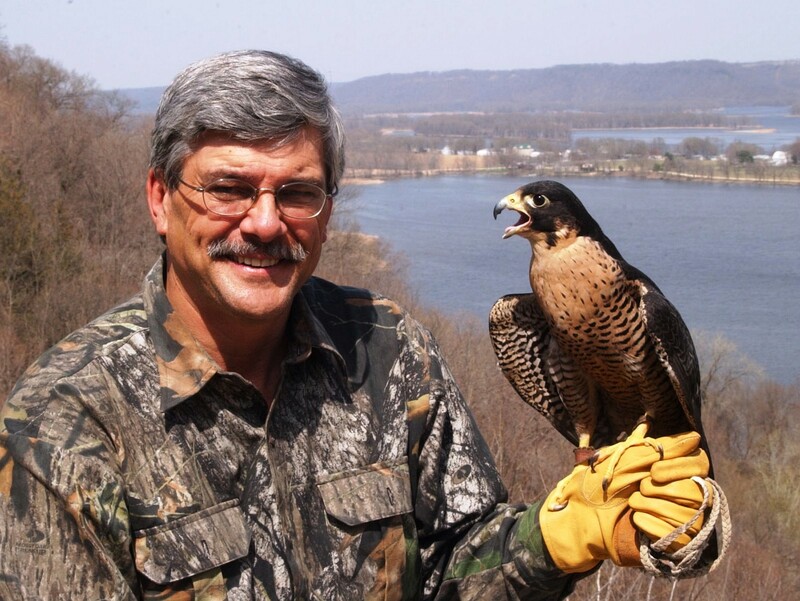 Flocks would be hanging at 20 yards or less one second, only to fall back into the wind and out of range the next. An occasional group would manage to get itself into trouble and we began to add a few greenheads to the bag. The storm was providing some exciting winter weather and time flew. Toward the end of the afternoon, the mallards suddenly changed their tune and began to decoy — point blank. By now, we all had three bird limits of Canada geese lying on the snow, except for Zach Scott who had been holding off somewhat and still had one goose to go. But whether or not we bagged limits didn’t seem important; the flight had been incredible and we’d all have plenty of duck & goose picking once the hunt was over. Goose traffic eventually slowed and we began noisily reviewing the events of the day. Our boisterous discussion was suddenly interrupted by the sound of an approaching goose. A lone honker soon appeared out the snow — on the deck and already appearing to be locked onto the spread. The big Canada was making his appearance just in the nick of time; less than two minutes of legal shooting time remained. Laboring into the wind, it seemed to take the goose forever to reach the decoys. And although the honker finally came to within easy range, Zach continued to hold his fire. 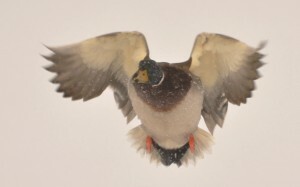 The Canada was now at the decoys and had begun dropping his black webbed landing gear. Finally sitting up, Zach shouldered the gun and fired. 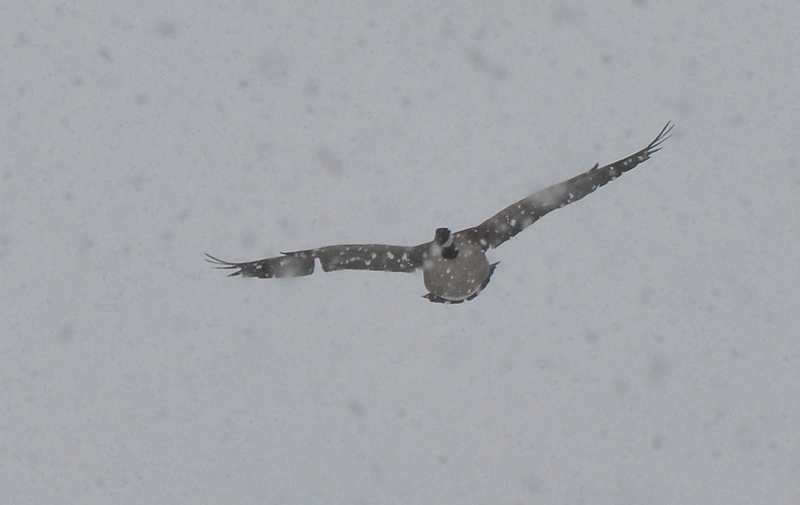 The goose folded and crashed to the corn stalks, sending up a geyser of snow that nearly reached my open coffee cup. The day’s final shot had provided a spectacular conclusion to one of the most dramatic waterfowl hunts I’ve been privileged to enjoy. It seems that some of life’s most pleasant memories often stem from those unplanned events that just sort of sneak in unexpectedly. 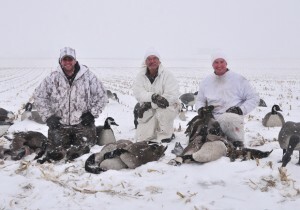 This year’s Thanksgiving gift of waterfowl certainly ranks as one of those events.